1) My first question is about the name of the film. Do I get it right that “come freely” is an old expression, not created during the last 20 years? Does that mean that one could be free after one’s death? That his spirit could come back freely? Or do I get it wrong? In fact, the Chechen word marsho (freedom) lies in the heart of various forms of greetings, goodbyes and wishes. It is a kind of blessing. For a Chechen the freedom is one of the key notions of existence. When you are in Chechen mountains, it is difficult to imagine any structure limiting this freedom. You do not ask yourself anymore what is freedom. It is there that it becomes obvious for you that a human being is free when it comes to this world. What would it become later? It is another question, it is not that evident. There are two poles in this film – being man and being woman. These are two different ways of perceiving the freedom: active promotion of the idea of freedom, which, unfortunately, is doomed to a tragic end, and a contemplative attitude, focused on accepting life so it could go on. Such acceptance is a real sacrifice, a full self-abnegation. To keep the tragedy inside oneself and to continue to live, one should be free also from oneself. 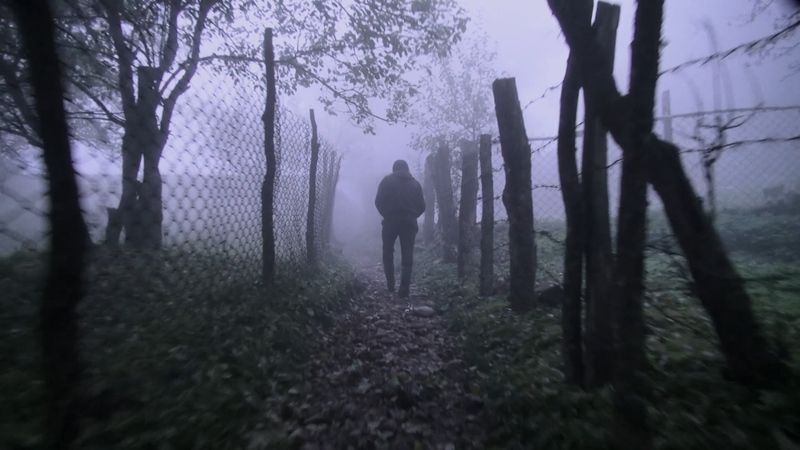 That is why the main structural elements of the film are related to the vanishing and dissolution in the landscape. In this context the death is still a tragedy, but one can survive it and, therefore, persist in staying alive. 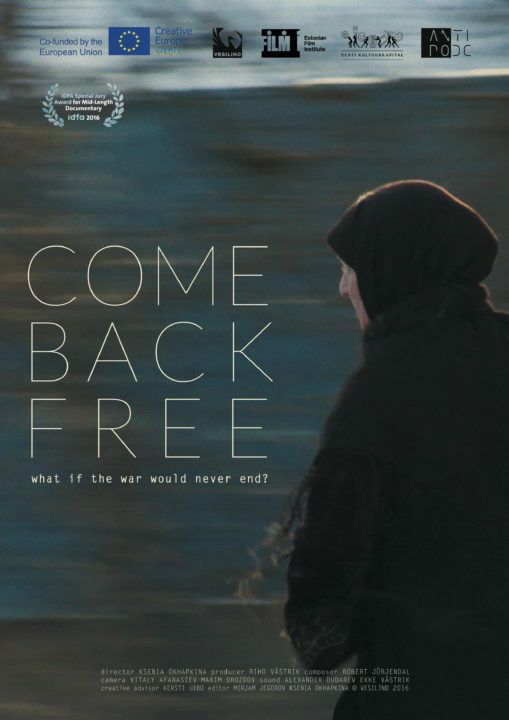 2) It is a rare film about Chechnya. It is not about the war or violence. I do not remember any such film shot in the last twenty-five years. Was it a matter of principle for you not to show all this Chechen background, nothing about Ramzan Akhmatovich Kadyrov, nothing about the politics at all? Why? In general, the Chechen background is well-known. Speaking about the war, there is already a wonderful film shot by Pirjo Honkasalo, which follows a similar aesthetic pattern. I feel that shooting a film about violence means witnessing violence. The film contains a scene of sacrificial offering, the one without which there would have been no film. However, the main meaning of the scene is not a bloody act itself but its impact on the person who participates in the sacrifice and is deeply transformed by it as we can see with our own eyes. The sacrifice changes the cultural pattern of those who live through it. In general, if there is a matter of principle for me, it is the impact. It includes the impact of my film when it comes to the screens. 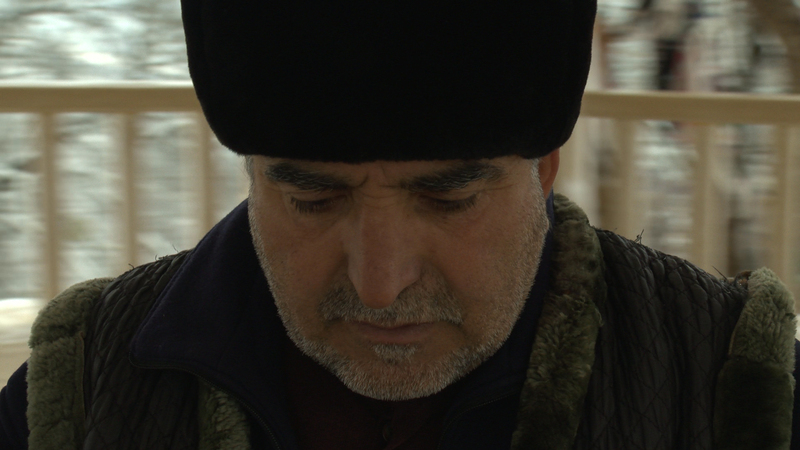 The practice shows that no film is capable of influencing political trend in Chechnya. However, the impact on lives of people who participated in the film can be tremendous if you chose to betray their trust and expose them to the danger. People filmed by our team showed great confidence. Our team was Russian but their communication was not between Russians and Chechens, it was between human beings. Our characters were sincere because they wanted others to understand, to feel what is to live in the situation when the death is always there, poised on the threshold and waiting for you. They wanted others to hear their human voice, overwhelmed by the political action that divides people and forces them to make sacrifices and to betray one another. Thanks to this confidence bestowed on us, we were able to plunge deep in the natural flow of life, to film it from the inside, to perceive certain mechanisms and to develop a system of some kind. This approach allowed us to use film for speaking to humans about humans from a human point of view. As a human being, I am more interested by global problems than by actual politics; that is why the latter is absent from my film. I was lucky to work with people who saw something else, something more important in my story. 3) In his interview to the New Times (14 November 2016) Mansky spoke about your film, explaining why he chose it for the Artdokfest: “The film is deliberately apolitical, it does not speak about things topical. This was Okhapkina’s decision, and she made a very powerful film. If it was the only decision of the kind, we would not probably notice it. But when all the directors refuse topical things, it deserves note. The country has not yet overcome its internal conflicts but they do not exist in cinema”. What do you think about Mansky’s opinion? Do you agree or disagree? Why? I partly agree. In Russia, authors really have to work in rather harsh conditions. It is quite difficult to find money for free reflections about important processes taking place in Russia and post-Soviet countries and stay in the profession. That is the reason. We are crazy people, all of us, we love cinema, and we want to make films. Besides, it is sometimes scarier to analyze things passing around us than to go into the mountains and muse on life, death and love. Though it is precisely what makes my film important not only for Russians. Recently, I started a topic which is culturally closer, and it is more difficult for me to handle. But I definitely will muse on life, death and love. This is because I wish to spend my lifetime doing something worthwhile. 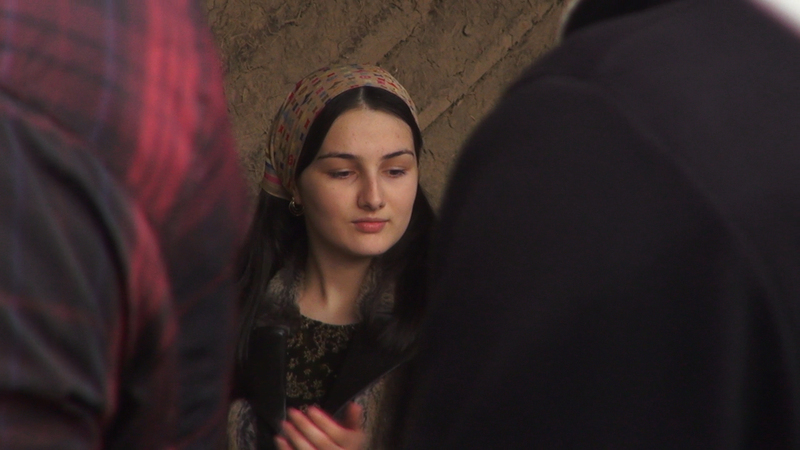 The Chechens inspired me to focus my attention on the essence of life and I hope my film will convey this experience. The main point is to find how things essential are refracted in different social and cultural situations. When this refraction is found, the story becomes a topic for a documentary. But to become a film, the reality should be refracted in the author’s eye creating the film language. If all this already happened, there is a documentary on an important question, and not just a journalistic video story. Such films are never numerous but they can be counted and serve as a base for further calculation. 4) When did you shoot this film? Why have you chosen this aul? One can see that this aul is somewhere in the foothills. In what district is it located? This is Haji Aul, formerly Pervomayskoye. When we first came here, three years ago, it was at the cemetery. 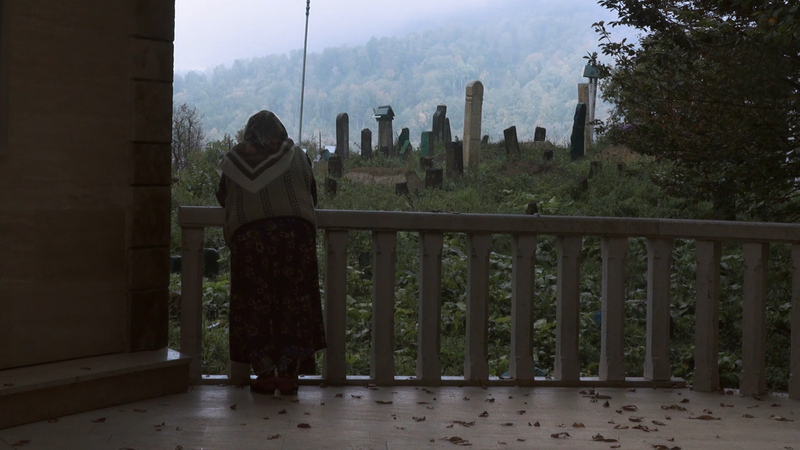 We filmed another story in Grozny and our hosts offered us to go to the mountains where they would show their holy place. It is one more background of this film, that stayed outside the camera’s view. The holy place was the tomb of Khedi, mother of Kunta Haji who brought Sufism to Chechnya, preached something like non-resistance to evil and then was banished and died in a Russian prison. 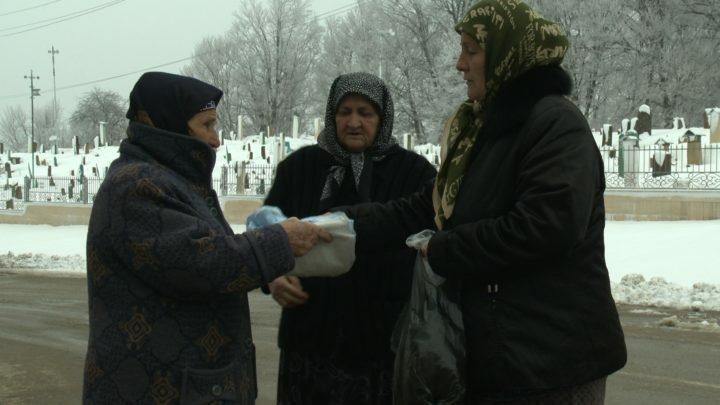 His mother, having outlived her son, was buried at the cemetery we filmed. 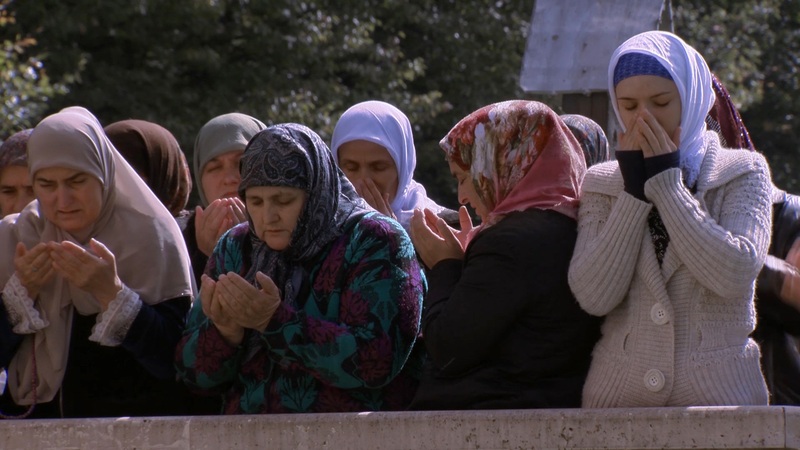 It is an archetypical story of Chechnya but we did not include it in the film because Kunta Haji’s name is nowadays used in a narrative that does not have anything in common with our film. I heard a few times people referring to Khedi as ‘our mother’. This is a place of strength, the tomb of a ‘great mother’, the recipient of all the sorrows. It was there that we met Ahmad, the custodian of the cemetery and descendant of Kunta Haji the peacemaker. 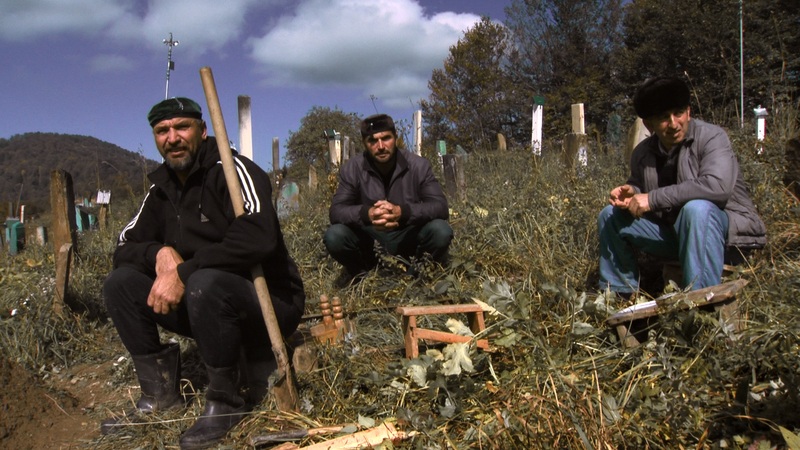 When Ahmad spoke about the dead, stroking their gravestones, it was like if he was introducing me to his family. He spoke with the visitors as with his family. It was a very strong and deep emotional experience. I just could not imagine it! That is why we made our film there. Almost everywhere, the sequence comes close to this communication between the living and the dead. 5) How did this topic seize you? How did you come to this idea? It was just like this. Afterwards, we started to research the life of the aul, we went deeper but this film, for me, is focused on love and death, on ‘our mother’. 6) How did you manage to come so close to the locals at all? In Chechnya, everyone seems so distrustful to strangers, especially with cameras. It is incredible how closely you could approach them, without speaking of filming them. Were the locals not afraid of problems? It is always the greatest problem: when the strangers are going away, the locals might get in trouble. Was it different this time? I already told a bit about it. We never insisted, somehow it just came out naturally. There was a bit of suspicion, somebody did accept us, somebody did not because they had seen many people with cameras and some of them had produced strong impression. However, the general level of delicacy and good manners is incomparably higher that in other places, even less conflict-ridden. Honestly, in a Belarusian village it was harder. Of course, I prepared myself, I studied traditions and customs, I prepared my team as well. I had good guys in my team. When in Rome do as the Romans do – if you do not respect this rule, wait for problems. It is the big problem of Russian-Chechen relations. We tried to avoid it. 7) Was it absolutely safe for you? We took care about safety. In the district, everyone knows everyone so if you travel together with a local, it is quite safe. There are no coincidences. Of course, your car can swerve on a highway spiral – this is an accident. But all other risks can be estimated in advance. I had to cancel one planned expedition because at that moment I had some doubts about the situation in the region as a whole. I would not expose my team. 8) I also wanted to know what is the name of the ritual on the 21st and 22nd minutes of the film, when women in a big room do not weep but wail? If I get it right, the woman on the forefront has lost her husband? It is a fragment of the same zikr. It is a female version. It is a rare occurrence because generally women do not do zikr. These are mainly widows, which are evidently numerous. As one of our characters remarked, men would not allow their women to go there. A poetic documentary about life in a war‑torn Chechen village, with the cemetery as its symbolic focal point. The village lives and breathes in unison. The Chechen gravediggers are always busy. Death is an everyday visitor. It does not even matter that yet another war has ended. The people live stuck in a circle of vengeance. They also gather into circles to chant prayers to God. Only the cows are grazing calmly next to the cemetery and the children are happily going about their business.